The RAM Force 9.5 is the ideal entry level dual disc clutch for street use. With torque capacity to roughly 700-foot pounds and a moderate clamp pressure, it will handle small blower or turbo installations and provide a light pedal effort similar to the stock clutch. The floater plate is driven from three sets of straps that eliminate any floater plate rattle at idle. 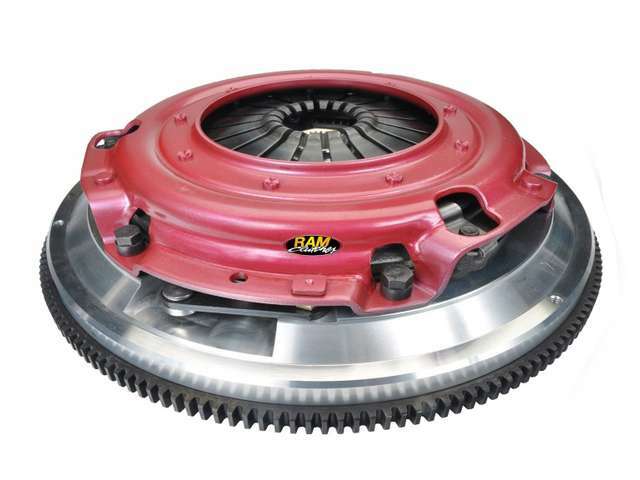 The top clutch disc features a sprung hub assembly that absorbs the initial engagement of the clutch and reduces the chance of chatter on takeoff. This clutch is compatible with factory hydraulic release mechanisms except as noted in the application guide. It is compatible with all factory master cylinder systems when used in conjunction with a RAM hydraulic release bearing.